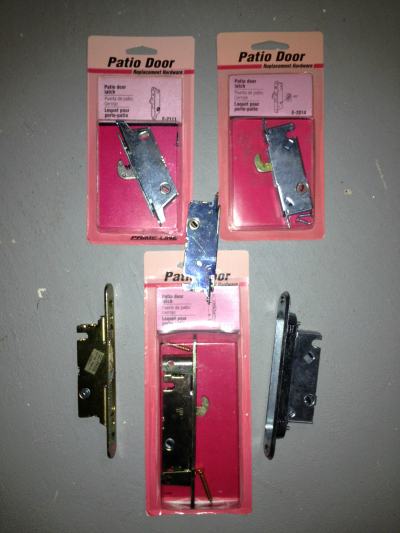 Patio door locks come in a number of different types. The most commonly used in aluminum patio doors are steel mortise latches. A mortise latch is set into a hole cut into the door frame. They are usually held in with screws. These latches tend to wear out over the years and either will stick in the locked position or will not lock at all. The exterior and interior handles are seperate from the actual mortise lock. The inside handles will often break and need replacement after years of use. Replacing the handles is not difficult. There are universal handle sets that can replace all sorts of different older handles. This is possible because the majority of handle sets are held on by 2 long screws spaced 3-15/16" apart. The Handle sets typically do not come with the mortise lock. The lock has to be purchased seperately. The handle set above is a universal type because it will work with a huge variety of steel mortise locks and door frame styles. There is an interior handle with a space cutout for the thumb lever which activates the lock. The thumb lever has a rectangular shaft that pokes through a hole in the door into a matching hole in the mortise lock. The part next to the thumb lever is the keeper. It is the part the latch hook catches onto when you look the door. It gets installed on the vertical door jamb. The remaining part is the exterior handle. It comes with three sets of holes. One set is spaced at 3-15/16" to fit the interior handle. That dimension is commonly used with steel mortise locks. The other spacings are intended for older style interior handles and locks. 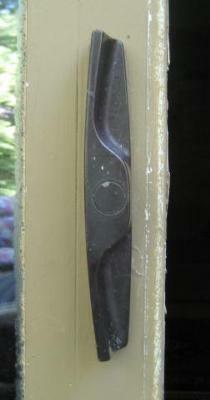 This exterior handle will work with 5-1/2" and 2-1/2" spacings if required. These are some of the mortise locks the handle set above is designed to work with. There are many more sizes and shapes not shown here which will work as well. The handle will also work with wooden patio doors as well. The only difficulty you may encounter is the need to use longer screws because wooden doors are usually thicker the aluminum. Most big box hardware stores will carry long machine screws but I usually find what they have in stock is often a bit too long. Never just right ! I often have to saw the screw shorter with a hacksaw and a vise to get the length just right when dealing with a wooden door. Keyed exterior handles are also available for the handle set above. The exterior handle has a "knockout" which when removed leaves a circular hole to accept a key cylinder. The key cylinder has a rectangular shaft that goes though the door and into the mortise lock. This allows you to open your patio door from outside with a key. The key is supplied with the cylinder. I have more different styles of mortise style handles on this page. Can these patio panel locks be keyed ? I have a 1965 vintage home with Anderson windows throughout. I don't know the brand of the 2-panel wood sliding patio doors, however they are original. I hope to find a cylinder lock that will fit the existing handle/lock for the panel so that I can enter from outside. 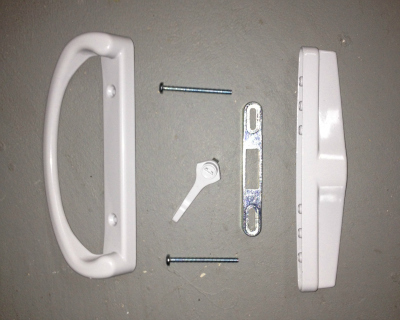 The current mechanisms and handles are in perfectly good working order, however there is only a "knockout" where a non-existing lock would fit. 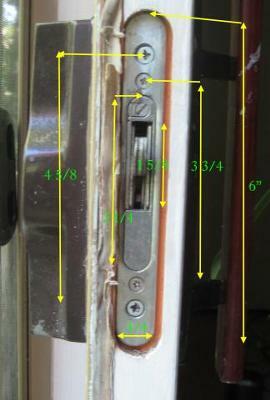 I've attached photos of the mortise lock and interior and exterior handles - measurements included. I'd appreciate any advice in finding what I need or even in figuring out who the maker of the panel is. Thanks for great pictures ! It certainly looks like there is a knockout for a lock cylinder on the outside handle. The only way to know for sure would be to remove the outside handle and look inside it. Once the a hole is made for the lock cylinder, it should just slide in place. A lever on the back of the lock cylinder engages the mortise lock and opens and closes the lock when a key is inserted. Any good local locksmith ought to be able to key one of these locks. I can also get the lock cylinder and key if no one local will help. Its also might be possible to buy the keyed handle if the latch lever for the lock cylinder proves difficult to find.